Dale Earnhardt Jr. signs autographs Wednesday at a fanfest hosted by Las Vegas Motor Speedway. Dale Earnhardt Jr., who despite going winless enjoyed one of his best-ever seasons in 2013, has been voted the recipient of the NMPA NASCAR Most Popular Driver Award for a record-breaking 11th consecutive year. Earnhardt Jr.’s selection breaks a tie with Bill Elliott for most consecutive Most Popular Driver Awards received. Elliott continues to hold the overall mark, having been named the Sprint Cup Series’ most popular driver 16 times. This year’s top 10 drivers, in order of votes received, were: Earnhardt Jr., Kasey Kahne, Jeff Gordon, Tony Stewart, Danica Patrick, Jimmie Johnson, Kevin Harvick, Matt Kenseth, Kyle Busch and Carl Edwards. 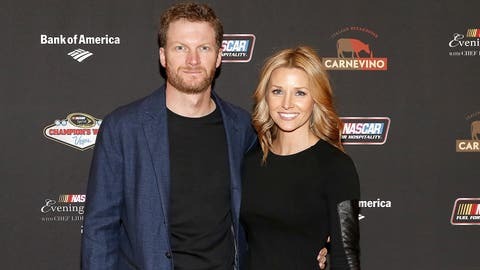 Dale Earnhardt Jr. and girlfriend Amy Reimann pose for a picture at the NASCAR Evening Series Presented by Bank of America at Carnevino at The Palazzo Las Vegas. "I don’t really keep track of the stats or the score, but Bill was a great driver and ambassador for the sport," Earnhardt Jr. said on Thursday in Las Vegas, where he received his award at the annual NMPA Myers Brothers Luncheon. "He represents the sport really well to this day, as does his son Chase, who’s coming up and carrying on the family name. But, I’ve always looked up to Bill as a driver, so it’s pretty neat." More than 1 million votes were tallied for 39 eligible drivers from this year’s first race to the last at the site www.MostPopularDriver.com. Fans voted once per day, with Earnhardt Jr. collecting more than 700,000 votes. "We always have such great support from our fans," said the Hendrick Motorsports driver, whose fifth-place points finish in 2013 matched his best since the introduction of the Chase for the Sprint Cup in 2004. "They always come through every year, and this year we feel like we were giving them a lot to cheer for on the racetrack, and paying them back for all the years they’ve voted for us to win this award."